Watching The Walking Dead Sunday night, I was unexpectedly treated to an unannounced and unadvertised preview of The Terror. Quite a change of scenario, but I’ll take two hours of horror over one any night! 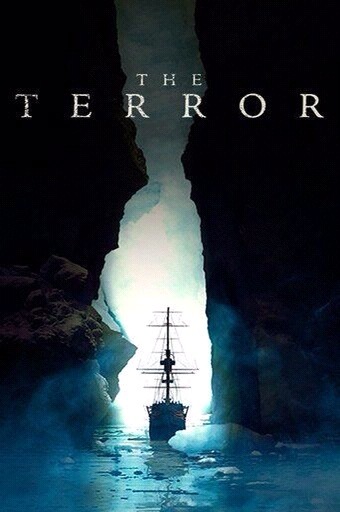 Probably, not everyone will be able to get into The Terror because of its period drama aspects. The pilot episode (Go for Broke) was mostly set-up and mood-setter, and some will be turned off by the rather trudging pace initially prevalent. I love this kind of thing, however, and enjoy its attention to detail and atmosphere. It’s all there; the dim lighting, the creaking of the great wooden ship, and the magnificent desolation of the arctic. Life was far more elemental in the mid-nineteenth century in a way that we early 21st century folks can only dimly imagine. Executive producer Ridley Scott brings a touch of Alien space horror to this tale, however. All of the elements are there; combine a bunch of superstitious sailors in close quarters in unknown and dangerous situations, and you’re bound to get a body count. Even the first episode, Go for Broke, brought us death, disease, delusion, and even a “space walk” in the form of deep sea diving. The sci fi/horror themes of malfunction, isolation, and paranoia that factored into such classics as The Thing are beginning to kick in here, and I’m on board for this arctic nautical nightmare! This entry was posted on March 26, 2018 at 9:37 pm and is filed under anomalies, anthropomorphic, cryptozoology, furry, furry horror, paranormal, sci fi, television, unexplained. You can subscribe via RSS 2.0 feed to this post's comments. You can comment below, or link to this permanent URL from your own site.